Shirin Neshat (Qazvin, Iran b.1957) is an Iranian artist currently living in New York City. From a young age, Shirin and her sisters were encouraged by their father to educate themselves, be independent and take risks. And so she did. While studying art in the United States, the Iranian revolution of 1979 took place and led to Iran becoming an Islamic republic. This prevented Neshat from visiting her home for almost 16 years. She has been an artist in exile ever since and fearlessly addresses the socio-political problems Iran and the Iranian women face through her work. She is mostly known for her work in the form of photography, video and film. Naturally, cultural and political events have impacted her artistic practice. 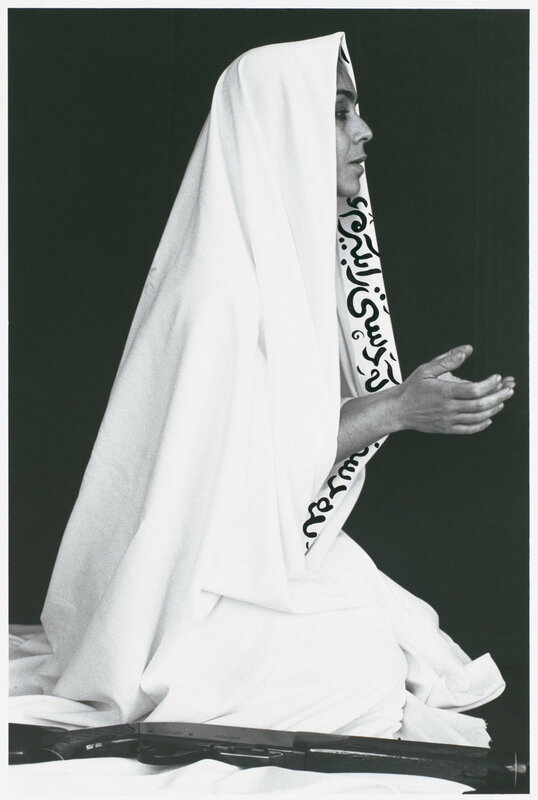 Neshat's body of work addresses the social, political and psychological aspects of what it is to be a woman, especially in today's contemporary Islamic societies. She resists and confronts how women are being treated in Iran, and middle-eastern cultures, wrongfully using Islam to undermine women's roles. But also, she fights the West's misleading and stereotypical representations of Muslim women as being "oppressed" and "submissive." Both extremities are unwelcome and Shirin Neshat is having none of it. From both sides. And the way she approaches her work is anything but belligerent, rather, sympathetic and incisive. I believe her work acknowledges the complexity and intellectualism that goes behind such a powerful subject and with the use of Persian poetry, her expressive calligraphy and imagery, Neshat’s work successfully reveals the relationship between gender, culture and society. I don't like talking about religion and politics on my blog but before viewing the below series, readers must be aware that Neshat invites the viewers to engage and view her photographs in a more open-minded manner. Such photographs can so easily disorient viewers, especially at a time when Islam is under so much scrutiny from the media, illiterately associating it with terms along the lines of "oppression," "fanaticism" and "terrorism." Instead, try and circumvent such poor beliefs and terminology and try to observe the photos in an unprejudiced manner. The Women of Allah series (1994) explores the themes of gender, martyrdom, faith, fundamentalism, devotion, anger and identity. 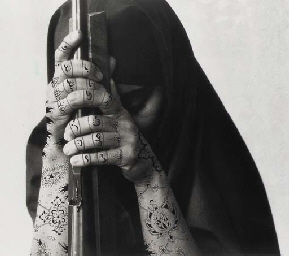 Already visually poignant, Neshat overlays the photos with relevant Persian poems, or verses from the Quran using calligraphy and decorative motifs that are innate to classical Islamic art. Duality is an integral part in Neshat's work in both content and form. She communicates the Iranian culture from what it was when she left to what it had become. A massive change. In her own words: "The change was both frightening and exciting." The photos are paradoxically both sympathetic and disturbing. And conceptually, her work goes far beyond the freedom of wearing the veil, physical appearance and mobility. It also translates to deeply existential issues that can relate to all women on a universal level. Neshat has a wide range of films, that similarly to her photographs, explore the same contemporary conflicts in Iran. My favorites are 3 films that were actually a consequent of the "Women of Allah" series. Turbulent,(1998) Rapture (1999) and Fervor (2000) are all similar in the sense that women are first placed in a predictable environment where they adhere to social and cultural norms, and slowly rebel against them. The theme of duality rises again as these films feature two projections of videos with male and female narratives taking place simultaneously and metaphorically addressing gender complexity and culture. For me, the Turbulent narrative stood out the most. On the surface, the film addresses the absence of women in the music industry in Iran. But we all know that this message speaks volumes and goes way beyond the "music industry." She uses the communicative power of music, with the left projection showing a man singing to a theatre with an audience of men, while on the right is a woman singing to an empty theatre. However, unlike the man, her song had no words. It was filled with a symphony of emotions and eloquent cries, which at first may disorient the viewers, but definitely intensify an emotional response towards the film. Neshat removes the traditional cinematic experience and allows us to engage with the visual conversation. The film is left open to interpretation and both visually and conceptually, she successfully created a dialogue that expressed the juxtaposition of the sexual hierarchy between men and women. It is a powerful film. You can see it for yourself here. There are many artists that explore similar themes to Shirin Neshat, but what makes her stand out is her nomadic essence and the global culture that is incorporated into her work. It transcends beyond the visuals and realms of art, from her sincere desire to connect to her roots and constant struggle to defend and declare human rights. In Neshat's words " Art is our weapon and culture is our form of resistance." Do you agree? 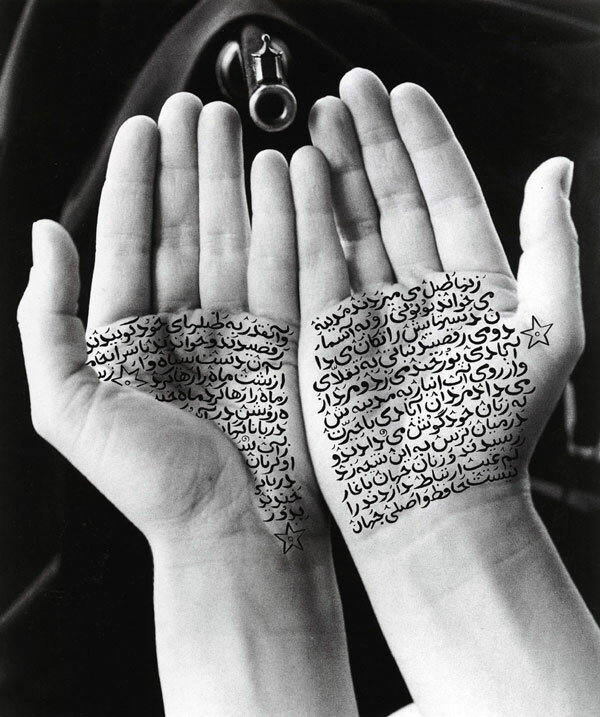 What do you think of Neshat's work? Comment your thoughts. 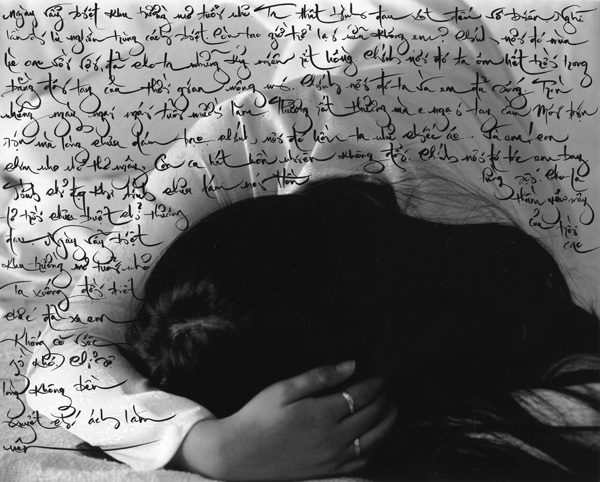 All images courtesy of Shirin Neshat.